I am not a Catholic. But my faith runs deep. And as I struggled to listen to the senator's funeral mass last Saturday morning, driving down the highway with my family on an out-of-state trip, trying desperately to distinguish the words of the speakers from the static on the lone radio station carrying the service, tears welled in my eyes. Tears of sadness, yes, but also of renewal. For in reflecting on this man's life, I felt my spirit enlarged, re-inspired. 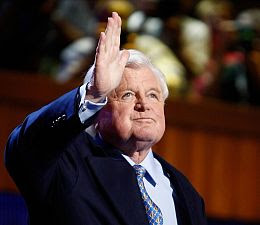 The work to which Teddy Kennedy devoted his life wasn't his alone. I recognize it also as my own, undertaken in my own way, as it has always been undertaken, and will ever be, by all who believe in the dignity and worth of every human being; by all who seek to lessen the violence that we human beings perpetrate against one another, in more forms than can be counted. The work belongs to us all. In tribute to that work, and to Teddy Kennedy's part in it, I want to share with you the "Prayer of the Faithful" from his funeral mass. It was just as this series of blessings began, offered up in Teddy's own words by some of his nieces, nephews and grandchildren, that the radio in our car went to full static. Voices unrecoverable. Reluctantly I switched the sound off. Entered silence. Though I suspected that I'd eventually be able to find the video of the prayer, or to read its transcript, I was still disappointed. I wanted to pray in that moment with the people, and for the people. All the people. Even those who spoke ill of the dead. As a person of faith who is committed to living as nonviolently as possible, I vow always to live this prayer as best I can, despite all my frailties, and perhaps even more, because of them. Deep peace on the running wave to you, Edward Moore Kennedy, you big-hearted rascal. Teddy served for 47 years, and he summoned us all to service. And so these intercessions are in his words, for the work of his life is our prayer for our country and our world. KILEY KENNEDY, granddaughter: For my grandfather's commitment and persistence, not to outworn values, but to old values that will never wear out. That the poor may be out of political fashion, but they are never without human need. That circumstances may change, but the work of compassion must continue. We pray to the Lord. RESPONSE: Lord, hear our prayer. GRACE ALLEN, granddaughter: For my grandpa's summons, that we will not in our nation measure human beings by what they cannot do, but instead value them for what they can do. We pray to the Lord. MAX ALLEN, grandson: For what my grandpa called the cause of his life, as he said so often, in every part of this land, that every American will have decent quality health care as a fundamental right and not a privilege. We pray to the Lord. JAKE SCHLOSSBERG, nephew: For a new season of hope that my Uncle Teddy envisioned where we rise to our best ideals, and close the book on the old politics of race and gender, group against group, and straight against gay. We pray to the Lord. ROBIN LAWFORD, niece: For my Uncle Teddy's call to keep the promise that all men and women who live here, even strangers and newcomers, can rise no matter what their color, no matter what their place of birth. For workers out of work, students without tuition for college, and families without the chance to own a home. For all Americans seeking a better life in a better land, for all those left out or left behind, we pray to the Lord. KIM SMITH, niece: For my uncle's stand against violence, hate, and war, and his belief that peace can be kept through the triumph of justice and the truest justice can come only through the works of peace. We pray to the Lord. ANTHONY SHRIVER, nephew: As my Uncle Teddy once told thousands and millions, 'May it be said of us, in dark passages and bright days, in the words of Tennyson, that my brothers quoted and loved, that have a special meaning for us now: I am part of all that I have met. Though much is taken, much abides; that which we are, we are; one equal temper of heroic hearts, strong in will to strive, to seek, to find, and not to yield.' We pray to the Lord. RORY KENNEDY, niece: For the joy of my Uncle Teddy's laughter, the light of his presence, his rare and noble contributions to the human spirit. For his faith that in heaven his father and mother, his brothers and sisters, and all who went before him, will welcome him home. And for all the times to come, when the rest of us will think of him, cuddling affectionately on the boat, surrounded by family as we sailed in the Nantucket Sound. We pray to the Lord. TEDDY KENNEDY II, grandson: For my grandfather's brave promise last summer that the work begins anew, the hope rises again, and the dream lives on. We pray to the Lord.